Irrespective of what the current config says I believe he was asking that it be possible to mount other ordnance on the centre pylon. Makes sense to me; I'd love to see a A-143 with x5 Mk82s and x2 7rnd HE rockets. Releasing a bomb from that station in flight risks striking them. So IRL it seems that position is only used for the gunpod or a fuel tank, and probably doesn't even feature an ejector mechanism. I don't think that would be an issue. Releasing a centerline-mounted bomb with speedbrakes open should probably be avoided, but nobody said you have to open them when bombing. Also, rocket pods aren't jettisonable, so even if there is a restriction against releaseable weapons IRL, it wouldn't apply to them. While I am not familiar with bomb release mechanisms of eastern military aircraft, I can speak of western designs. From a weapon release standpoint, most hardpoints or "pylons" use pistons to physically push the bombs away from the aircraft. Not only to create some distance between the aircraft for collision avoidance, but also to ensure that the weapon releases with the correct angle. If a bomb is released with two much "nose down", it may oscillate upwards again and strike the aircraft belly/tail. Often there are small explosive cartridges inside the pylon that are responsible for creating the gas pressure that act upon the pistons to "discharge" the weapon. I don't really think that this is the primary issue here. I think it may be a design limitation due to either weight distribution (center of gravity) or structural limitations. Compare the size of the wing pylons to the center pylon. They are much larger. Also remember that the wings generate upward lift, which means that they "carry their own weight" during flight. The fuselage does not, and any weight added to the fuselage will counter-act the upwards force of the wings. This creates a lot of stress on the structure, which is also why the center body fuel tank of large aircraft is usually emptied during taxi, before takeoff. The center of gravity may shift too far forward, causing the aircraft to pitch down. This requires a lot of trim to compensate for. If the aircraft is flying close to the trim threshold, it becomes a risk to even attempt to fly it. A typical eastern russian GP-bomb weighs in at around 500kg, whilst U.S bombs weigh typically either 250kg or 1000kg. This may very well apply several tons of rotational force on the aircraft`s pitch axis. So while adding a bomb to the forward pylon may seem like a simple task, it may actually be physically impossible due to such factors. Here's a little bonus to you that shows failed weapon release tests from USAF. It can get quite hairy! Fuel or guns also weigh their share, so it's neither structural nor COM considerations (I'm not saying it has to carry nukes in there). Clearance might be an issue (I wouldn't try fitting an AMRAAM on the mid pylon), but as far as I can figure, a small 250kg bomb or a rocket pod should be fine, at least. With all due respect, what makes you so certain? I've checked 4 sources now and they list all models of the L-39, none of which equip anything but 23mm gunpod or reconaissance pod. I could not find a single mention about bombs or missiles on the centerline pylon. When it comes to aircraft weight and balance, it's part of my job. 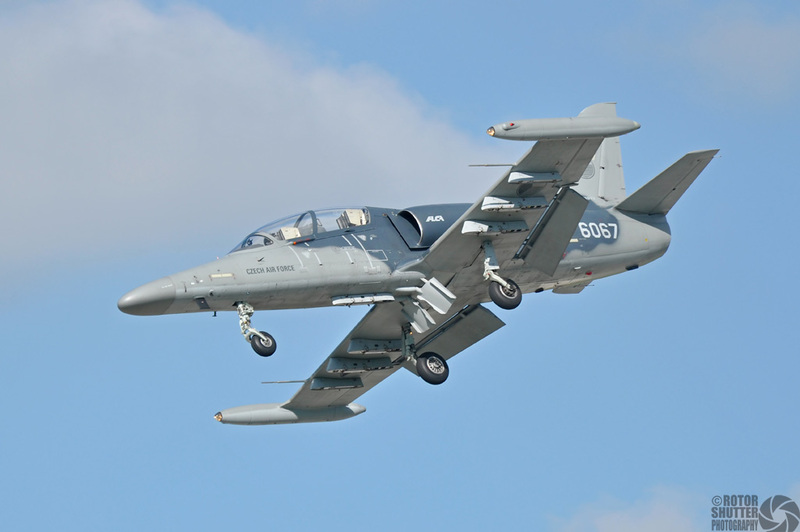 I don't have access to L-39 W&B charts, but I know that on smaller aircraft, placing a 50kg bag in the aft compartment may shift the CG outside limits and cause the plane to crash on takeoff. Also remember that a 250kg bomb equals 1750kg at 7G's ? That's like hanging an SUV from a small point under the cockpit. buuut, since the jet in ArmA isn't real, you could probably do whatever you want to be honest. edit: I see the L-159 super albatros can hold about 2300kg on center pylon, but no mention of bombs specifically. That's where I was coming from. It can carry 2300kg, so any restrictions in what can go there will be based on length (it can't block the airbrake) or available pylon interfaces. Of course, that other weapons are compatible with the pylon doesn't mean they're going to be commonly carried. Pilots probably want the gun, in most cases, not to mention heavy load in there would move the COM forward, stabilizing the aircraft and decreasing maneuverability. It'd probably remain flyable, but much less nimble with 2 tons hanging in there. Also, FYI, the Plamen gunpod weighs 229kg full, which is not far from 250kg of a typical small bomb. Missiles like AIM-9 are even lighter (about 80kg, in that case), and 7-tube Hydra pods don't weigh much, either. If it can carry the Plamen, it should be able to carry a lot of other things (again, barring length restrictions). Pilots probably want the gun, in most cases, not to mention heavy load in there would move the COM forward, stabilizing the aircraft and decreasing maneuverability. As for what pilots want it strongly depends on the mission and what enemies you face. You are right on the account that adding forward weight may increase stability, but reduce agility up until a certain point. I have manually loaded AIM-9s so I know they weigh as much as a full grown man. What makes it special is that AIM-9s are rail launched, while bombs are dropped. That means that a rail type "launcher" is required for AIM-9 and a "pylon" with hooks is required for most bombs. While it may theoretically be possible to load bombs on the center pylon, it may not be practical in any case. I guess to settle it we would have to talk to someone who works on the jet, as I can't dig up anything more specific than the jet having 7 hard points. This has anyways been a huge digression from the intention of the thread so I am ending the debate as inconclusive until proven by a credible account. BI already stated that theyre going to leave most of the pylon balancing to mission editors. As a result the only thing that should really determine if it fits or not is clipping with the model or animation sources. Oh well i wont lose sleep over it, im loving what we've got so far and I cant wait to see what other aircraft will get the dynamic loadout treatment. I cant wait to see what other aircraft will get the dynamic loadout treatment. It would be amazing to see configurable loadouts on helicopters and even ground vehicles too. It would be cool if they included various loadouts for tanks, so you could set the amount of APFSDS, HEAT, MP, Canister, Missile etc. Maybe even gun calibers? I know it is unlikely but this would be really nice - have dynamic turrets on all vehicles. Being able to switch out the main guns on wheeled vehicles would be great. Example would be on a patrol with 2 vehicles - 1 HMG, 1 GMG - one vehicle gets damaged but can't be repaired. You'd rather have the gun on that vehicle so you dismount it and load it up into the other vehicle as a static weapon or replace the turret on the working vehicle. this is beyond the ability of Arma 3 engine, unless you're happy to use unanimated weapon models. What eggbeast said -- the reason that it's aircraft that community/vanilla loadout selection were about is because of very real differences in how underwing weapons were handled (read: proxies with limited animation necessary) versus vehicle turrets with gun pods being a notable not-quite exception. wouldn't be far fetched. They added in a Bonus jet in the Jet DLC, i dont see why they can't quickly model or have existing turrets for example, modular and create a system to dynamically place them on faction specific vehicles for example in the Tank DLC, which in of itself could also add new types of turrets, etc. This would drastically boost the possibilities of the game from now and the future of Arma. It would virtually kill the "not enough vehicle content" spam that happened during Alpha, Beta, and release because of the possibilities. It's like having cloths, but for vehicles. However, since i've heard that the Jet DLC isn't being release this month (end of Q1), i really do want Bohemia to create a variety of new weapons for aircraft, now with the Dynamic loadouts, they can add so much variety of options like real aircraft have. Instead of just One Bomb, an AA Missile, ATGM, and rockets, now we can add more smaller bombs, more powerful diameter rockets, air burst munitions, Long Range/Short Range munitions, extra countermeasure pods, etc. Hey now, i've modeled before. Making the munitions isn't the hard part, it's the scripting. I agree on that part, i've no skill, or maybe i haven't taken the time to understand the code... none the less, however, the effort, would be worth it for now, and Future Arma titles, hands down. Though i'm not really calling it a small effort, as with more munitions for aircraft would also require an eventual counter from the ground. I can agree with that. I love the Neophran, but the thing that gets me is not having fire modes for rockets as well. Could use a burst mode. I'm getting an error (repro'd 3 times now) where any weapon mounted out of it's normal position on the To-199 (Dynamic Loadout) plane results in instant CTD with a memory access violation. Can anyone else reproduce? Negative, at least not on my end. I've been rolling it out with all sorts of configurations and it works fine. Maybe take a screen or short video? With the animateBay command, will there be a complimentary animationPhaseBay or something rather? Also how does one go about setting up bays? Not sure if this is the right place to post it but it does have to do with the dynamic loadouts in a way. Am I the only one that noticed a sneaky M82 bomb on the dynamic loadout?